The only particularly bright spark from the youth candidates. I'm hoping he can develop into a good player though. The two strikers whom I brought in at the start of the season: Stevenson and Walton are both doing well in my under 18 squad and have recently been called up for the England under 19 team. It'll be three/four years until they'll be near the first team squad but it's nice to see they're progressing well. Season 22/23 - We Survived! The season has finished and thanks to three wins out of last eight, we managed to stay in the league. I'm buzzing we managed to stay up and as I said previously, I am looking to get rid of many of my older players in the Summer, as well as players who want more money than around £50k or so. I'm planning on getting rid of Mata and Sanchez. Antonio Marcos, despite doing better at the end of the season, will also be made available for transfer. Bruno Maia is the best player in my squad and has been my player of the season but wants £130k a week so he will either leave this Summer or next Summer, I'm still undecided. Overall, I am happy with how we did this season. I always knew it was going to be a tough season with all of the changes but we managed to survive which is great. Throughout the season, we massively lacked a solid out and out goalscorer. I was hoping that that man would be Antonio Marcos but he has only managed 9 goals in his two seasons at the club. Even though his stats are class, he just doesn't seem to play anywhere near the level he could. I bought him for £2 million and am looking to get around £12/15 million for him in the Summer so it will hopefully be a nice profit. So now the preparation for the new season starts. I've been given a nice budget to work with and hopefully next season my young players will really kick on and turn us into a force to be reckoned with next season. The budget is good anyway but with the perspective player sales as well, it should be very nice. Thanks for everyone who has read up to this point and bring on next season. It's 3 and a half stars man so not great. 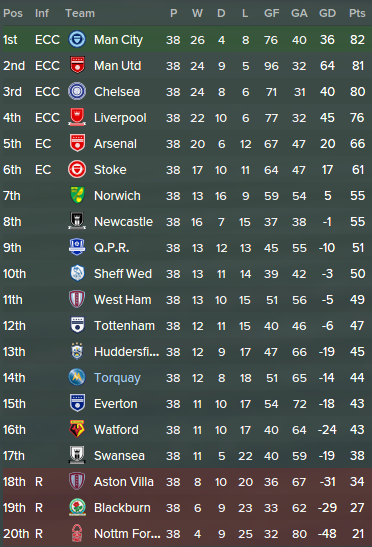 Newcastle finished 8th last season so it's always nice to be offered but I don't want to leave Torquay any time soon. Nice to see Super Luke Young is still in the top five of player shirt sales. It's no surprise that Bruno Maia is top, he has been absolutely amazing for me this season with an average rating of 7.78. It's weird because he still can't get into the French squad but it's their loss in my opinion. It's a shame that he wants so much money so at one point, he will have to leave. I will not be wrecking the future of this club for any player. If they want to leave, or they want too much money, they can go. Yes, this may hinder my capability to improve and challenge for Europe every year but in my opinion, it's not worth the risk. I'd much rather just hunt for new hidden gems and see where they can take us. Juan Mata and Adam Maher are two players that I will be looking to get rid of in the Summer. Mata only actually managed ten matches for me and to be honest, was crap. His legs have well and truly gone. Maher is a good player but he's turning 30 next year and Luke Young will always start ahead of him, even though Maher has better stats. He's valued around £8 million so could get a nice profit for a player who joined on a free at the start of last season. Hlavaty is a player I expect to really kick on next season. He's only 19 years old and is playing for the Czech national team on a regular basis, he will be a class player. A good season surviving mate! Well done! Survived comfortably in the end! Cheers lads. I was always confident that we would stay up. I just hope it's not as stressful as that next season, just need to see what I can do in this Summer transfer window. For the eighth out of my nine seasons at the club, once again Luke Young has been crowned the fans POTY. Despite his stats not being particularly impressive, he continues to be my star man year on year. In my opinion, Bruno Maia should of won the award as he was absolutely brilliant this season but the fans just seem to adore Captain Fantastic Luke Young. I expect him to be a key player in my side for the next few seasons at least and I don't expect him to ever leave the club. This guy will become my assistant once he decides to retire. I've played a little bit of this this morning and completely forgot to screenshot that players stats from last season which is a shame. However, my key players were Maia, Cross and Young. Look at those history stats, amazing to see that despite now being 30, he can still pull the strings in midfield. Especially after starting with us in the Conference. 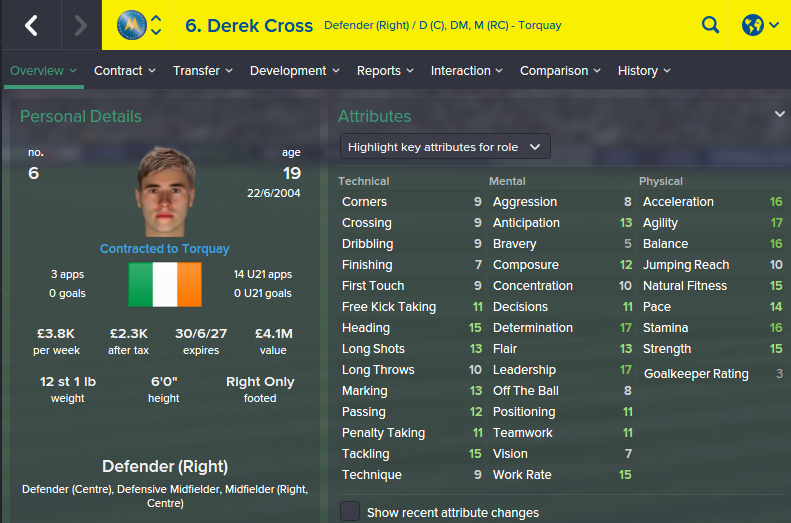 I brought him in midway through last season and retrained him as a CB. Alongside Vincent Kompany he has a great mentor to ensure he improves. This season he has been a revelation at the back for us and his form got him a call up for the national side which is always pleasing to see. I'm very excited to see how this guy does next season which will be his second season as a Premier League player. The season is close to starting and I've made some deals that may shock some of you but I firmly believe that these are the best deals for the club. We have made £56 million this Summer transfer window, making big profits on many of the players sold. My POTY Bruno Maia was the first player to leave the club. As I already said previously, he was moaning about wanting a deal and was asking for wages around the £100k a week mark which I just couldn't accept. All along, this career has been about not spending stupid money on wages and attempting to make a profit. 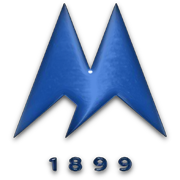 To sell a player for £26 million, when only 9 years ago we were in the Conference is a great bit of business by the club. He arrived last season for £8 million so we made a £18 million profit on his sale. Antonio Marcos was the next player to leave the club, joining fellow Premier League side Huddersfield in a deal worth £15 million. His stats are absolutely brilliant however he never seemed to do the business at Torquay. He managed 9 goals in 65 appearances which is no where near good enough for a player of his quality. He will probably turn out to be an absolute beast for Huddersfield but unfortunately it just didn't work out for him here. He bought him for £2.8 million which means we made a £12.2 million profit on this sale. 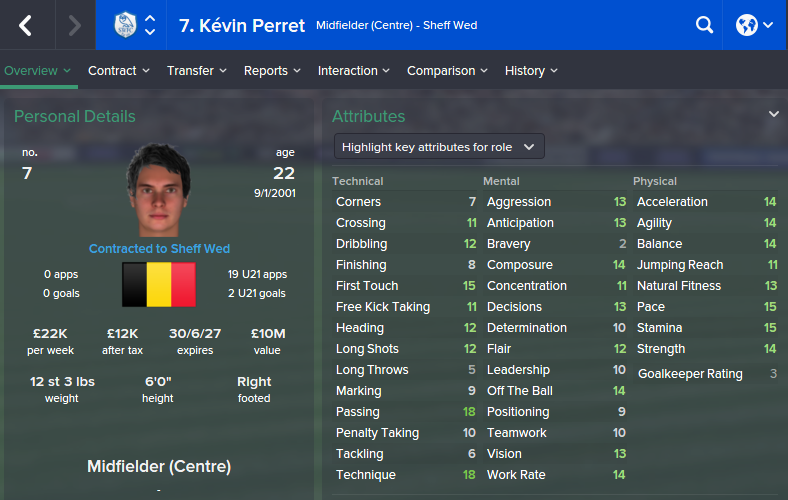 Kevin Perret left the club for a fee of £7.5 million after a few seasons of Tafari Zuill and Luke Young keeping him out the side. He actually spent all last season out on loan in the Championship so to get £7.5 million for a player who never plays in very pleasing. 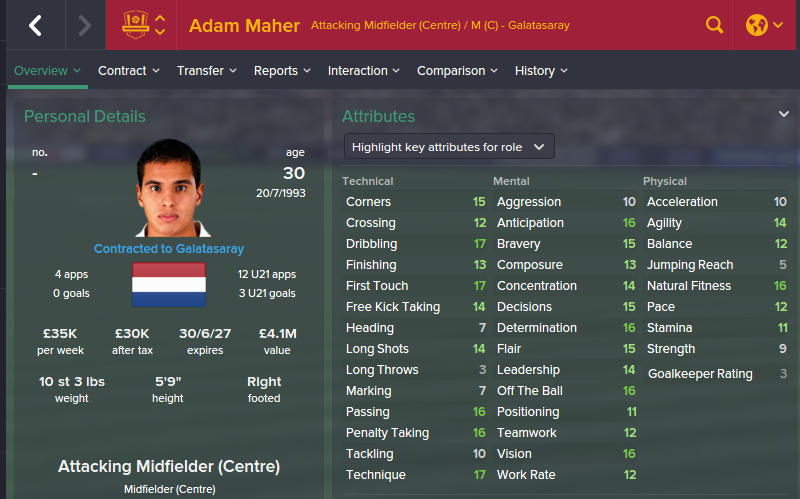 Adam Maher left the club for £6 million after one season at the club. He actually is a great player but unfortunately for him, no player gets in the squad ahead of Luke Young so it just didn't work out for him here. 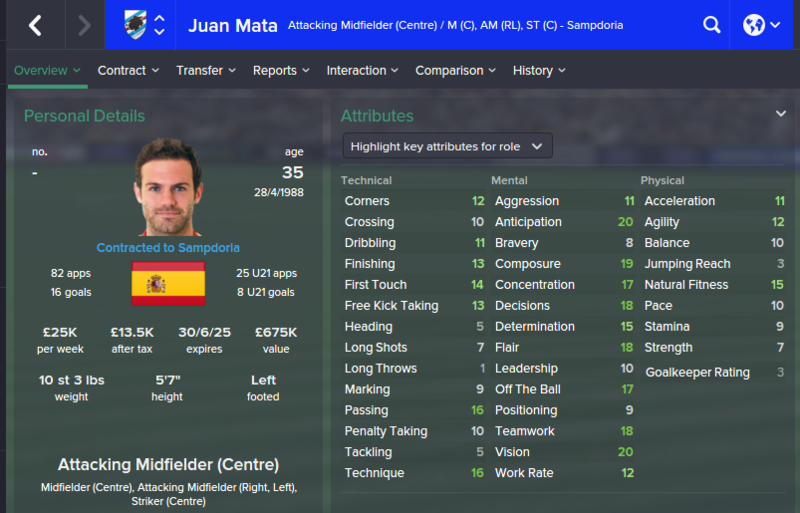 Juan Mata leaves the club after a disappointing 10 appearances at the club. His legs have gone and the deal worked out at us gaining £100k a game relating to his appearances so that's nice. Alexis Sanchez also left the club on a free transfer despite scoring 9 goals for us last season. Four players joined the club in the Summer, mainly to fill the void of the players leaving the club. Robson Teram is included as he joined the club after his work permit was accepted following a loan move in Belgium last season. I'm really happy with these signings, it will be interesting to see what you think. 22 year old French striker joins the club from French side OM is a small deal worth £300k. I'm not too sure how we managed to get him for such a small fee but I'm not complaining. I'm expecting big things from this lad and he's a massive improvement on Mata, the player that N'Sonde has been brought in to replace. This guy was a player brought to my attention through an agent. I wasn't expecting his stats to be as good as they are and I am pleasantly surprised. To get a player of this standard on a free transfer is an absolute steal. He's still quite young too so he should have a good few years left in him. He will be sold for profit in a few seasons but for now, I'm expecting he will be a big player for us. Antonio Marcos' replacement and a player I hope to have a much better goal return. He's only 21 and with those finishing stats, I'm hoping he will be the answer to our goalscoring problems. He's another player who can be sold for profit if he fails to make the grade. Bruno Maia's replacement. I was worried when selling Maia that I wouldn't be able to bring in another player with the same quality, I was wrong. Yes, he is the club's highest ever transfer fee but he's a class, class player. His stats make him a perfect replacement for Maia as a complete wing back and I'm confident he can fill the void. A few players came moaning to be after Maia was sold, I'm sure this signing will shut them up. This player was brought in last season but couldn't gain a work permit. Fortunately, he has now gained one and he's a lad I'm very excited about. He seems to have that Samba style of play about him and he's a player I expect to light up the Premier League. To sell the players we did and bring in these players, I feel is a great bit of business. The majority of the outgoings were ageing so to replace them with young players with potential, for a smaller outlay is very pleasing. Once again, we are predicted to finish 18th this season so again, survival is the aim with anything else being a bonus. I'll update you all ten games in and see where we are. Some great additions there mate! It's been a while since I showed all of my squad broken down so please find below my squad for the upcoming season. I do have more players but they are either in the under 21/18 sides or are out on loan. The players below will be the players used for this season. 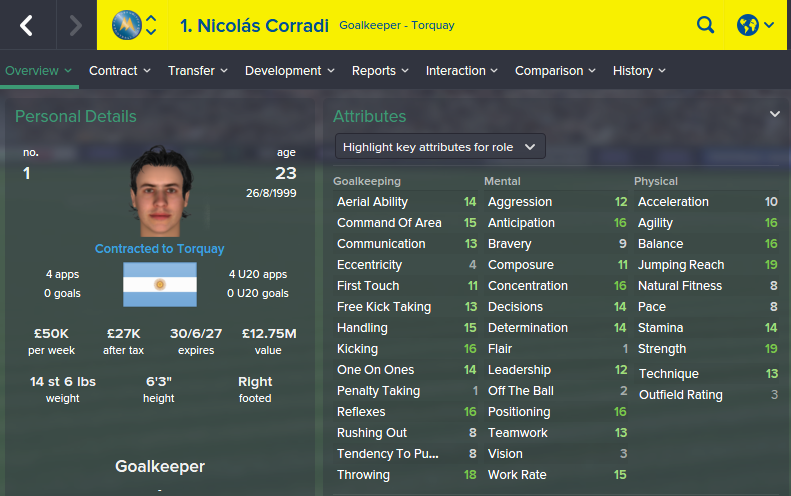 Nicolas Corradi - My number one goalkeeper after arriving last season. 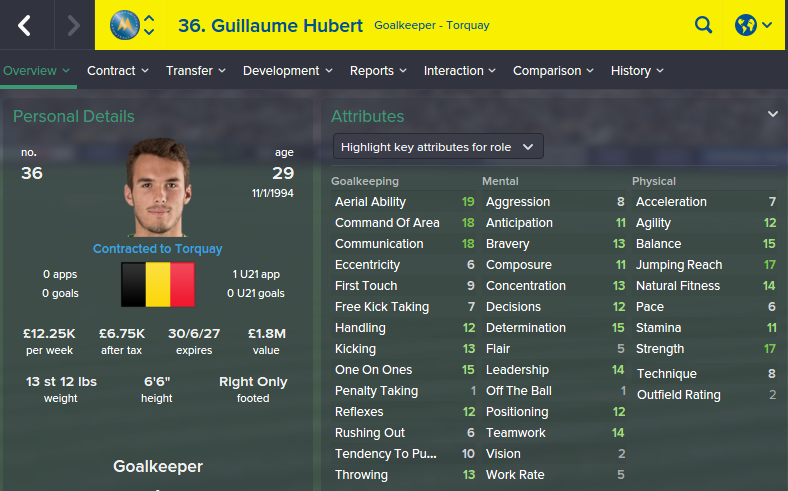 Guillaume Hubert - Entering his seventh season at the club but will now be my number two goalkeeper. George WIllis - Number three goalkeeper and fills the English quota. 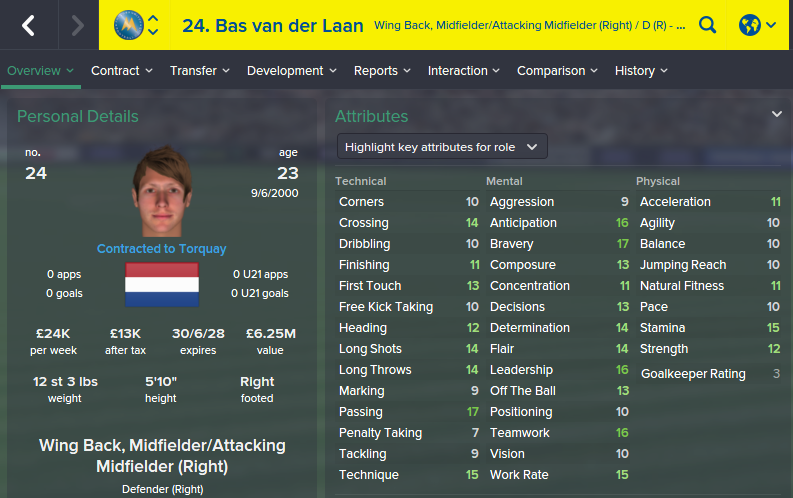 Bas van der Laan - Good back up at right back, can play in midfield too. Was subject of a bid from Everton but signed a new deal here instead. 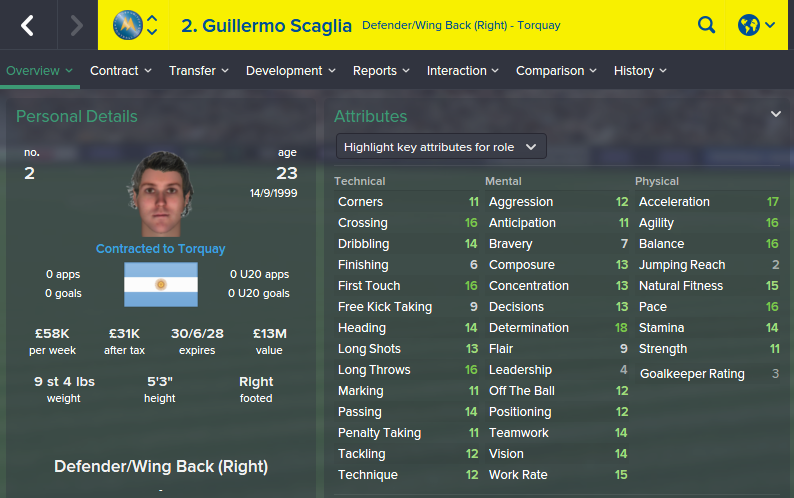 Guillermo Scagila - Right back signed in the Summer from Genk. The club's highest ever transfer fee. 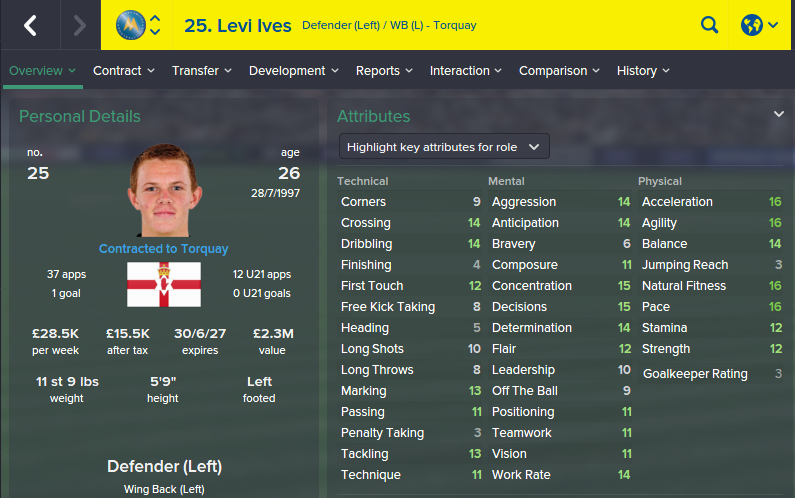 Levi Ives - Starting left back who has been with us since our days in the Conference. 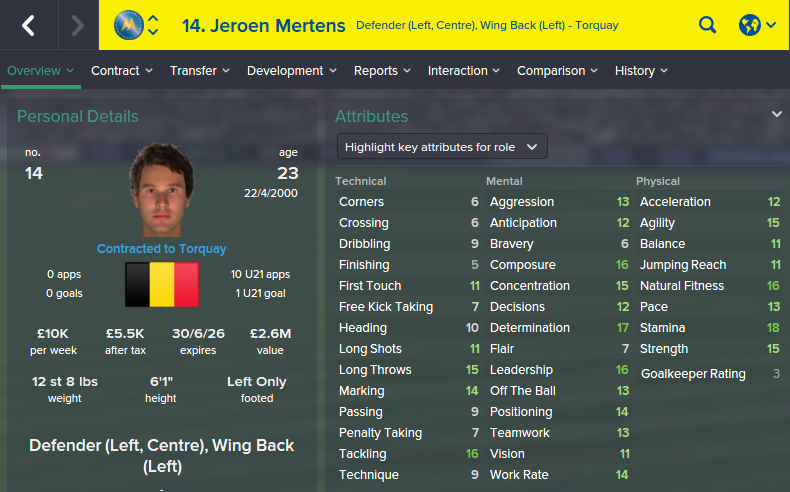 Jeroen Mertens - Back up left back who can also play at centre back. Vincent Kompany - 37 years old but great experience to have in the squad for the younger players. 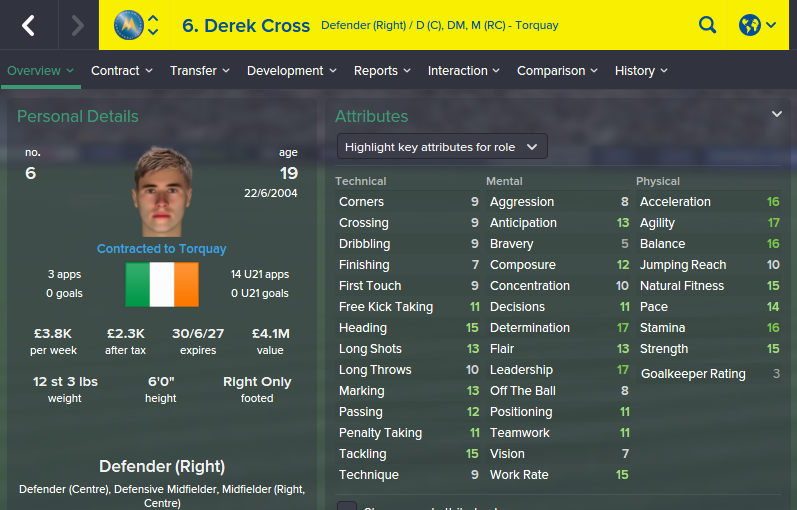 Derek Cross - 19 year old defender who I'm expecting big things from in the future. Mohamed El Haj - Young centre back who keeps on improving. One for the future. Krystain Pearce - Been with us since our days in the Conference, more of a back up player now. Rhys Bennett - Been with us since our days in League One. Again, more of a back up player these days. Patricio - Been with us since the Championship days. He has developed into a really solid midfielder. Jan Vavra - Czech under 21 international who should become a big player in the future. Gary Shuttleworth - Young English midfielder who joined us at the start of last season for a fee of £7.5 million. 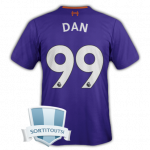 Was a bit part player last season but should get more game time this season. Luke Young - Captain Fantastic. Won the fan's POTY 8/9 seasons at the club. Tafari Zuill - Probably the most talented player to come out of Torquay's academy. Robson Teram - Signed last season from Corinthians. Massive potential. Alula Naser - 20 year old English winger who joined us at the start of last season. Started off his career at Fulham and he's a player who should be great for us in a few seasons time. Theo Bongonda - Summer signing from Belgium side Zulte. Can play either on the wing or up top. Matej Hlavaty - Czech international winger who finished our top goalscorer last season. Can play on either the left wing or up top. Kevin N'Sonde - Summer signing from OM. French under 21 international. Bart Mulder - Been at the club since he was 16. Spent loans out of the club in previous seasons, will probably be loaned out again this season. Kept purely for sentimental reasons and fills the home-grown quota. Jiri Vacek - 19 year old Czech international striker. One for the future and entering his third season at the club. Rosero Rios - 21 year old signed in the Summer from Ajax after a successful loan spell in Belgium with Anderlecht. Columbian international striker, having scored twice in six appearances. Some good players coming in there! That French striker was crazily cheap! Just signed this guy and he's one I'm very excited about. He has only played once for Crystal Palace's first team but grabbed a hat trick on his England under 19 debut. I forked out quite a lot to get him but he's a player I feel can have a very bright future in the game. I managed to get him for an initial fee of £2.5 million for another £2.5 million paid over 48 months. 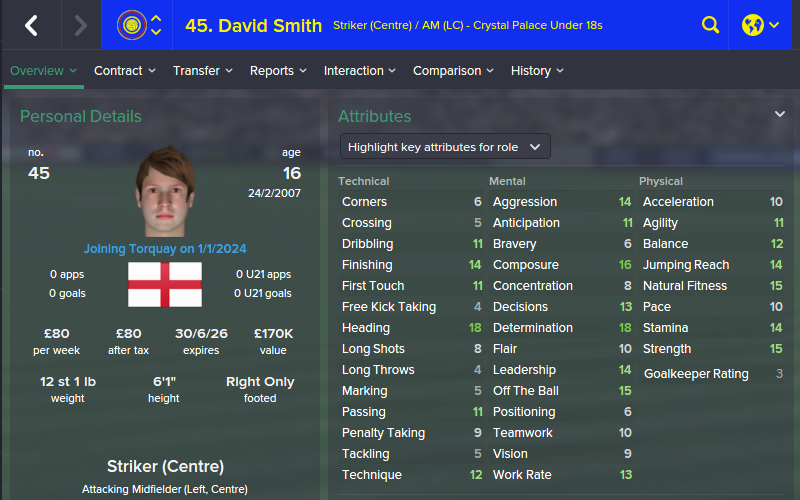 Yes, its a risk to pay so much for a 16 year old but I have a feeling about this guy. This has been one epic career from you Fola in which you've taken Torquay United from the Conference to the Premier League without going overboard every single campaign. It's a career that had heartbreak and joy throughout the years and this deserves it's place in Susie's HoF, it's a little shame that it was cut short but enjoyable while it lasted. Fola! Its been almost 5 years since you started this storie, it was an amazing read, thank you so much!